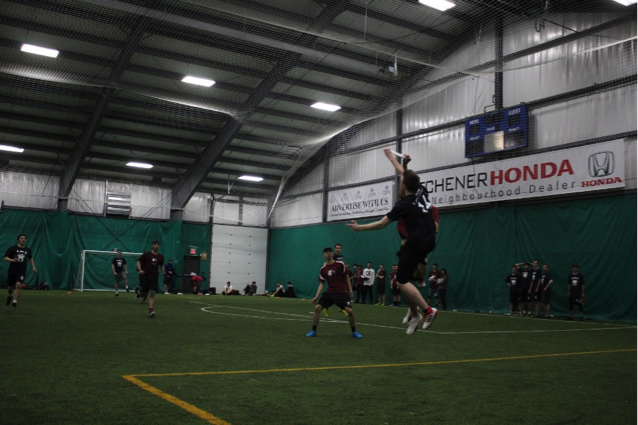 The Lakehead Ultimate Club team traveled to Waterloo this weekend for the 4 on 4 Canadian Eastern University Indoor Series. The Open team began the day at 9:10am playing against Western. The Thunderwolves came out strong winning the game 15-9, as Aaron Brecka scored 6 points. The next game they played a tough McMaster team, as they went point for point but McMaster was too strong and took the game 14-11. The Open’s last game of the day was against Carleton. They started the game focused and ready as, once again, Aaron Brecka played phenomenally with 5 assists and 5 points and Eric Bongelli contributing with 6 assists. Seogium Lim played shut down defense as Stewart Macpherson dominated the sky, out jumping multiple players to get the point. The Open Team finished 2nd in their pool and are playing tomorrow in the quarterfinals. The Women’s Team dominated the compeition on day one playing the best ultimate in Lakehead history. Their final record for the day was 4-0, beating Western, McMaster, Sherbrooke, and Waterloo. All the women played consistently and skillfully. In their first game against Western, Erin Murphy racked up 6 points, and Lily Colquhoun and Katie Guidry played shut down defense. For their last and final game against Waterloo, Jasmine Ferdousi had 2 lay out catches, one to save the possession and the other for a point in the end zone. Chuhang “Kity” Zhang had a phenomenal last game throwing 7 assists, connecting to Erin Murphy once again for 6 points. The Women’s Team play tomorrow in the semi-finals! This is the first time Lakehead Ultimate has competed in the CEUIS, and they have displayed great composure and spirit throughout the tournament. Good luck tomorrow to both teams!